Don’t forget the HarBUG 2017 AGM will be held this week, as part of our Cycle-to-Work Day, Wednesday 13th September. AGM will be in Room G59, Diamond House (on the RAL site, beside Restaurant). Meeting Room signed from the Diamond House entrance. 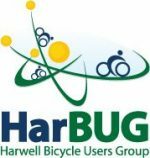 Please come along, get involved, and help with the running of HarBUG, one of the largest and most successful Bicycle User Groups in the country. Feel free to bring your lunch! This year’s AGM will be on WEDNESDAY 13th SEPTEMBER at 1230, as part of the Cycle-to-Work Day. The venue is still being finalised, but is likely to be Diamond House on the RAL site. The AGM is a great opportunity to have your say on campus cycling matters. Don’t forget, HarBUG is one of the biggest and most active BUGs in the country. So please come along, get involved, and help to continue HarBUG’s success! All committee posts will be up for re-election at the AGM. In particular, our long-serving Treasurer, Justin, is retiring. So we do need a new treasurer for next year! Cycle Campaign Event This Saturday – Please join us! As part of its ‘Space for Cycling’ campaign, Cycling UK is holding a number of rides and events around the country this Saturday 22nd April. In Oxford, there will be a gathering outside County Hall at 2pm. As part of the Wantage Festival, HarBUG will be taking part in the ‘Micro Earths’ event on Thursday 27th October. See Micro Earths Poster for details. At 7.30pm in The Beacon, Wantage. Tickets £6. The HarBUG Annual General Meeting will take place on WEDNESDAY 28th SEPTEMBER from 12:30 to 13:30, in the Lounge (top floor) at RIDGEWAY HOUSE. Please put the date in your diary and please attend if you can – feel free to bring your lunch with you. If you have any proposals / issues you would like to discuss please let me secretary@harbug.org.uk know before Friday 23rd September. All HarBUG committee posts are up for election, so please consider helping to run HarBUG! The posts up for election are Chair, Treasurer, Secretary, plus general committee members. If you think you might be interested, let me secretary@harbug.org.uk know by Friday 23rd September. HarBUG has been asked to draw your attention to a petition which would require parliament to consider a new law requiring vehicles to leave a minimum safe distance when overtaking cyclists. If you live in or near Wantage, you may be aware that the FINAL ‘pre-submission’ version of Wantage Town Council’s NEIGHBOURHOOD PLAN is now available for comment. Once approved, the Neighbourhood Plan will be a mandatory element of all future planning approvals in Wantage. It includes policies and proposals for Cycling. The consultation period runs until FRIDAY 20th NOVEMBER. As a result of comments already received on earlier drafts, cycling now has a much higher profile in the Plan document. But the aspirations in the Plan will only carry weight if they are framed as mandatory requirements. Developers should be explicitly required to build fit-for-purpose cycle infrastructure, and the planning authorities should be explicitly required to examine planning applications for cycling content which conforms to proper standards. PLEASE comment on the Plan, using the link above, by FRIDAY 20th NOVEMBER. The HarBUG Annual General Meeting will take place on WEDNESDAY 16th SEPTEMBER from 12:30 to 13:30, in the Lounge (top floor) at RIDGEWAY HOUSE. Please put the date in your calendar and please attend if you can – feel free to bring your lunch with you. If you have any proposals / issues you would like to discuss please let the HarBUG secretary, Guy Wilkin secretary@harbug.org.uk , know before Friday 11th September. All HarBUG committee posts are up for election so if you would like to help out running HarBUG please contact the secretary. The posts up for election are; Chairman, Treasurer, Secretary, plus general committee members. The consultation period runs until FRIDAY 17th JULY. Hopefully this public consultation will re-inforce the message that cycling is a priority issue for Wantage. The draft document refers to a specific Cycling Action Plan. HarBUG members are already involved with this. But we think the aspirations for cycling should be expressed more formally and forcefully in the Plan document itself. As a minimum, developers should be explicitly required to build fit-for-purpose cycle infrastructure, and the planning authorities should be explicitly required to examine planning applications for cycling content which conforms to proper standards. PLEASE comment on the Draft Plan, using the link above, by FRIDAY 17th JULY.